On Saturday, April 28, the Lloyd Center participated in “A World of Discovery”, an event hosted by P.A.C.E. Inc., Child Care Works as a part of their annual “Week of the Young Child”. The halls of Greater New Bedford Voc-Tech High School were transformed for the day into an interactive and playful world for local young children. The featured entertainment was plentiful and varied. Visitors jumped in bubble bounces, listened to storytellers, boogied during family Zumba and enjoyed performances by Toe Jam Puppet Band. 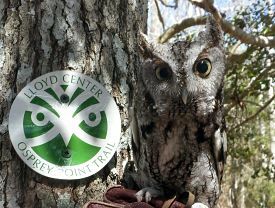 The Lloyd Center’s very own Eastern Screech owl ‘Koko’ was a featured guest, meeting and captivating hundreds of tots and adults alike! Child care educators of New Bedford, Dartmouth, Fairhaven, and Acushnet—nicknamed “Brain Builders” at the event—provided crafts and activities tables for children. Visitors who stopped at the Lloyd Center’s table had the opportunity to create blossoming paper bag trees or try their hand at our mysterious “Whatz-It Box”. Families were also delighted to learn about our free Visitors Center and affordable family programming! The Lloyd Center values community outreach events such as “A World of Discovery”. These events provide us with the opportunity to network with other local educators and to directly connect with the Southcoast families, adults, children and students we serve. Keep an eye out for the Lloyd Center during monthly AHA! Nights in New Bedford and at other Southcoast Events. And, as always, please feel free to visit our property at no cost or attend one of our affordable, interactive Outreach programs! We hope to see you soon.